Tamil Nadu is suffering the worst drought in last 140 years and the peasants from the state are demanding a drought relief package from Centre. In a case of sheer abuse of power, a BJP leader in Tamil Nadu slapped and thrashed a farmer leader P Ayyakannu outside premises of Sri Subramania Swamy Temple in Chennai. 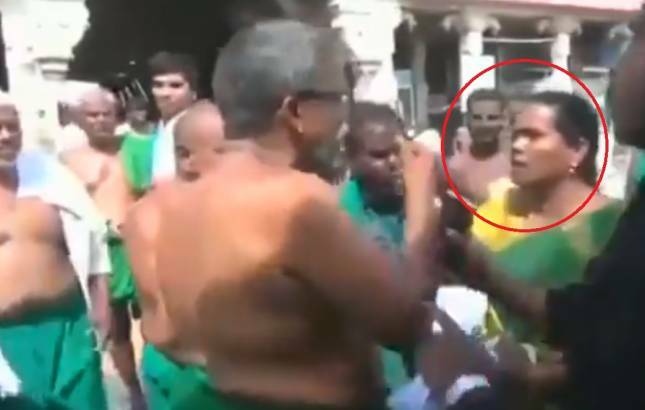 In a video tweeted by ANI, district Secretary of the BJP's women's wing Nellaiyammal is seen slapping Farmer leader who was allegedly distributing pamphlets criticising Narendra Modi-led Central government. In the video, while some people are seen trying to intervene, the BJP leader goes more aggressive and shows her slipper to the farmer leader. Farmers across the country are angry with Modi government over a range of issues. Tamil Nadu is suffering the worst drought in last 140 years and the peasants from the state are demanding a drought relief package from Centre. Farmers in BJP ruled Maharashtra are also staging a protest march against government's "anti-farmer" policies. They are demanding complete farm loan waiver and implementation of recommendations of the Swaminathan Commission.